I've long bemoaned the fact that there's no where to go for good dessert after a dinner - somewhere you can chill and let your sorrows and tribulations be eased away with a sweet treat and some delicious chocolate. Sure, there were places like Swensen's and Bakerzin, but they often closed by 10pm, which was when most dinners ended, and they didn't quite have that relaxing, lounge vibe. Then places like the Chocolate Factory started popping up, but still they closed relatively early at 11pm. So I was truly excited to learn that Janice Wong was opening 2am Dessertbar, a bar devoted almost exclusively to desserts and the occasional tipple, which, true to its name, would close at 2am. I was even more excited to learn that 2am would be located in Holland Village, adding a touch of class to what is rapidly becoming a more developed FnB scene. At 24, Janice isn't much older than I am, but she has a wealth of experience under her belt. Possessing a diploma from Cordon Bleu, work experience in the kitchens of Sydney and Les Amis, Janice has some truly amazing qualifications to helm Singapore's latest dessert-oriented offering. 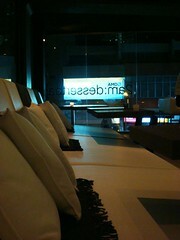 2am definitely has the look right - sleek and modern, resplendent in off-white and plush brown, an entire wall has become just one long reclined couch complete with pillows, allowing you to slouch lazily while enjoying your dessert. Should you prefer something with a little more backbone, you can choose to sit at one of the islands, or even at the bar itself and have the pleasure of being served right at the counter. What I don't like about 2am is the way they've designed the menu. Presently they have one bold heading, and the components of the dessert listed underneath, so what you see in the picture is Green Tea: creme brulee, frozen white chocolate dome, apricot. Personally this sounds like a list of ingredients, rather than a description of the dessert. At $14, this is also pricier than what many restaurants would charge, so it shouldn't bee too much to ask for a more enlightening description. 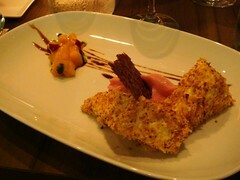 I ordered the Cheesecake: "smoked", blood peach foam, mango, breadcrumbs. What it turned out to be was a tobacco-infused cheesecake, coated with breadcrumbs, served with a peach foam and a chunky mango coulis ($15). I didn't quite enjoy this, as I'm naturally averse to cheesecakes, and I couldn't really taste the smoked tobacco. The cake was, however, much lighter and airier than normal cheesecakes. While the breadcrumbs coating was meant to give the cheesecake a slightly deconstructed look, I felt this had the effect of making the cake more powdery than was necessary. 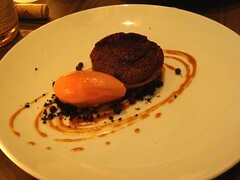 The star attraction is probably Chocolate: warm tart, wild nettle, salted caramel and blood orange sorbet. I thought this was very impressive, as I've never seen a tart version of the ubiquitous warm chocolate cake before. Satisfyingly runny beneath a soft, creamy exterior, this artistic dish was a hit with the chocolate-loving girls. Janice also generously provided a plate of home-made churros drizzled with chocolate sauce, but we were all too stuffed to do justice to her delicious creations. 2am Dessert Bar is extremely promising, and as it gets more popular it would be very advisable to reserve seats in advance. Their grand opening is the first weekend of October, and I'm sure they'll be packed. While the prices are not exactly cheap, sometimes it's worthwhile to splurge a little bit on desserts to make up for a lacklustre meal, or to get your daily sugar fix. As you would all probably know by now (if not, where have you been? ), Gunther's is the new kid on the couture food block. Set up by Gunther Hubrechsen, lately the chef at Les Amis's flagship. Gunther is backed by the Garibaldi group, hence explaining why the interior of the restaurant looks somewhat like the place next door. 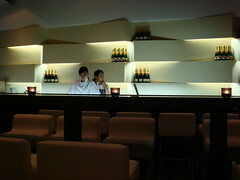 I really like the ambience of this place, though it's a little too grey and I really like their breadrolls. Call me simple but I think I can eat two of these in each seating, it's beautifully crusty on the outside and soft on the inside. Perfect for scooping up those sauces! We decided to go there for Colin's farewell lunch and we had both the set and the tasting menu. The set menu for lunch is $38 and comes with a starter that is probably best described as a flavourful sunny-side-up-egg (yes, I can hear the howls of protest from food lovers but honestly people...) that's served with a portobello mushroom and some cured ham. The mains are a choice of beef tendeloin or pork and then Gunther's signature thin crust apple tart dessert. The pork was excellent, soft and succulent and walking that thin line between western and eastern cooking. The beef was alright, a bit more plain, though the thin candy spun nest of crisp was brilliant. Colin had the $128 tasting menu, which includes three starters- the delightful, luxurious cold angel hair pasta with oscietra caviar ($55), the mouth watering foie gras ravioli in clear broth and the pan fried foie gras encrusted with pistachios and served with warm cherries. The two mains include the very Chinese-tasting grilled Scottish bamboo clams with tomatoes and grilled mushrooms. This is probably my least favourite dish, given that I felt the tomato juice and chinese sauces overpowered the delicate bamboo clam. The main is a choice between fish and braised veal, which is served in a thick mahogony sauce and just falling off the bone. Colin liked the veal very much and he's quite the expert at braising, so I'd take his word that it was excellent. I had also come on a previous occasion for the tasting menu and had so accumulated some photos of individual starters that we'd swapped into the menu like their ubiquitous mushroom carpaccio. The fish main, which is the alternative to the veal, is also very good, thick-cut and supple, though I think it is very heavy and could be better paired with a lighter sauce! The dishes are rich, yet deft and simple, with clear flavours and uncomplex textures. I am already a fan of Gunther's from Les Amis and because of his baked bread and piglet with Kriek beer but it is marvelous to see him at the helm of his own place, greeting customers and being able to take more risks with the menu. 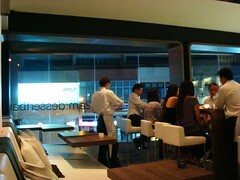 I'd definitely rank it as one of the places to eat in Singapore. Rather than have massive amounts of the thin apple tart (I've known people to come here just for this dessert, as well as detractors who think it's just rubbish that it's so thin and unsubstantial)...personally I like its thin airy cinammon prata-ness....we opted to have a few more dessert choices. We had a molton chocolate cake with basil ice cream(which was a bit sub-par, not least because it had erupted before reaching the table) and a orange Grand Marnier souffle, which is one of my favourites. The meal ends with home-made macarons, solid little blocks of truffle chocolate and the signature caneles. I don't think Gunther's really needs a recommendation, his reputation is enough to warrant an experience there, surely? Book early though, the tables fill up quickly nowadays. And stay on the set menu and out of the wine list (I've heard the cheapest bottle is $160 before it jumps up to $800 and I bet corkage ain't cheap!) unless you are out to pay for a good time. Some weeks ago, we had a rejoinder to the flogger dinner, when Ivan kindly invited Colin and I to dinner at Cafe de Amigo. The main event was supposed to be their Argentinian beef but when seated, we realized that that had been banned to Singapore, or something like that. Cafe de Amigo has a pretty long history and I was amused to see it's now at Funan the IT mall, which is not particularly intuitive for a restaurant. It used to be at Specialist Center and their forte was some Hainanese specials, like their chicken chop, their rough baby blue tableclothes and their affordable, family-friendly prices. It's sort of the equivalent of a Singaporean diner. The proprietor of Cafe de Amigo is also the most amusing man. Tommy's very Shanghainese and prances round greeting people in his red suspenders and funky glasses. He's made himself into an expert on wine, culling comrades from the higher society of Singapore and hosting their culinary and wine events at his restaurant's private room. He's the sort of person who will effusively greet you and ask your name, then later on have little recollection of what it is, except if you follow it up with a big dinner order. A smart businessman and Cafe de Amigo is a smart business. For that and other reasons, I have never really been enamoured of this place but was glad of the suggestion that we come here as I hadn't been for a long time. We started the meal with cheese sticks and Colin had a bisque. He also had the oxtail, which looked good and I had a small piece of Wagyu. Ivan generously allowed them to cook all the Wagyu together and then for a quarter piece to be sliced off for my plate as that would keep it moist yet firm. The larger piece of Wagyu pictured at the beginning was for his plate and cost close to $200 so it wasn't exactly a steal though the rest of the meal was not expensive. The cooking is really honest, simple and unpretentious. The place also has a lovely wine cellar stocked with very good vintages and the restaurant is absolutely BYOB. There are some rough edges to the place, like the food is often served way too fast or else really slowly and there have been reports of bad experiences and increased prices but I think it's pluses outweight its peculiarities. Level 2 Funan Digitalife Mall. Funan Digitalife Mall, Singapore 179097. For Colin's birthday this year, we decided to have a casual family dinner at the Bistro Au Petit Salut in Holland Village. Since the move of Au Petit Salut to its new swanky location in Dempsey, the old original Au Petit Salut has been re-made into a more bistro type restaurant. The old yellow walls and medium wood furniture is gone and in its place is a darker, sleeker environment. I liked it a lot, the look is a lot cleaner and there are a lot more choices for food, which wasn't the case before. Part of this is because Patrick has moved over to Dempsey and Jason is at the helm of the kitchen, allowing each to focus even more on their menu and ingredients. The night that we were there, there were a whole bunch of specials which I really appreciated as my chief complaint about Au Petit Salut before was that the menu choices were stale and rather unimaginative. We ordered a mushroom dish, with termite, white matztake and fresh abalone mushrooms. It was really savory and yummy. And relatively healthy! That matters a lot nowadays. What I had to have though, once it was pointed out, was the extremely unhealthy cold foie gras terrine. Rich and smooth, it came in a generous slice and was fantastic. Luxurious. The nice thing about the bistro is that the old favourites are still there and still well done, like their French onion soup. Colin had a portobello mushroom with goat's cheese, which was also very good. The appetizers set a good tone for dinner, they were all of high standard, the produce was fresh (maybe they've benefitted from joint purchase with Au Petit Salut Dempsey) and they came to the table piping hot. A plus! My mom and I shared a 200 day grain-fed Black Angus Sirloin Steak which was lovely, very juicy and tender. As I get older, I find that I really shouldn't be eating whole steaks anymore (except of course, when you can't help it or when your stomach just says so). She was confused though, as to how grain-fed was different to aged and how come Black Angus and Sirloin were the same piece of meat. Oh Mummy..! Colin left me to do the honours, waggling his eyebrows dramatically and muttering something under his breath about tastebuds. I keep having to remind him that despite my earlier attempts in life at raising his hopes in this regard, he is unfortunately not adopted and actually related to the rest of us in the family. The other main was a Pan Seared Onglet Beef with Shallot Confit and Mashed Potatoes, which was also good but I prefered the Black Angus Sirloin. The restaurant has this curious system where they have a set dinner for a certain price (I believe it was $48) and then you can also swop in a starter, main and dessert from the specials, for the price of $48 plus whatever the excess price of the particular special is. Does that make sense? It didn't make that much sense to us, there was the added complication of all starters are $10, all mains $30 and all desserts $8 or something like that. Anyway, if you order all three, your bill saves you a small sum of $2 or something and the point I was trying to make was not that I understand the pricing mechanism (I clearly don't), just that the prices aren't as high as Au Petit Salut at Dempsey, they are relatively attractive and the best thing is the staff are trying harder than they have for a long time. It was endearing and commendable effort on the part of the chef especially and definitely deserves your support. I was going to say that the service of some of the wait staff, especially those who look like they've been bought in through the immigrant channel, is lacking and they need better training (note to Alice) but Colin remonstrated "Aiyah, you're so evil". Really though, you can tell when it is lacking when you are biting back requests because you know they probably won't understand you and the problem will only get worse. So onward to a part of the menu that actually needs work- the dessert. The fresh hot desserts have been taken off the menu, to simplify things but that really an effect of dumbing down dessert as the last course. The chocolate cake was hard and the profiteroles uninspiring. 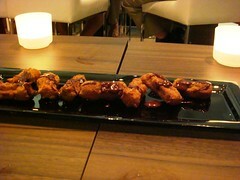 In this day and age, unless they are a knock-out, one shouldn't be serving profiteroles. The ones at PS Cafe are by the way, filling, fantastic and a lot better than the ones we had here. Go pay them a visit, the standard is improved and higher than I've ever remembered. 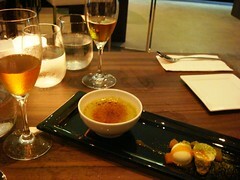 Apart from dessert, I really enjoyed this meal and it's become one of those places you want to bring your friends to. I'd been meaning to do this for awhile, make some healthier cookies then my usual chocolate, macadamia nut, dark chip versions. Next up, a vanilla raspberry swirl cookie! This cookie was inspired by something I tried at an awesome dinner at Watcha and my dining companion raved about it, so of course, I had to try to make it for him. The cookie has green tea and azuki beans which means its...bittersweet! Brilliant! At the last minute, I swapped out the walnuts (urgh, not my favourite thing in the world) for pine nuts because they're healthier and they look so cute poking their little pointy heads out of the green skin. You can also make these with almonds and mix ground almonds into the flour for a more nutty cookie. Tips to the wise, you have to cream the butter and sugar till its light and fluffy. Don't continue if your mixture has curdled or if it isn't light bright white yellow and well-whipped. The cookies just don't taste the same and these don't have the denseness of chocolate to mask the texture (or lack thereof). Add eggs and stir in sifted flour with baking powder, matcha, azuki (drain the liquid from the beans and discard) and pine nuts or almonds. If you use ground almonds, substitute 1 cup of flour for ground almonds to keep the consistency. If you really want to, you can swirl in a drop of green colouring to make the hue a little more tea-like. Roll mixture into small balls and flatten slightly. You must be able to roll this mixture, if not your cookies are lacking flour and are going to emerge melted and flat. You can press a flaked almond into the top if you're into that kind of thing. I just like to use Silpat so that they slide off easily and I can throw a new sheet into the oven right away. Bake at 190C for about 15 minutes, makes 40 small cookies. This recipe is a cinch, I was done with mixing it up in 15 minutes, which makes it an entirely accessible way to destress And get a yummy product after work. (Or at work?) Enjoy! 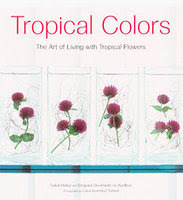 This book is a must if you want to learn how to utilise tropical flowers in arrangements. To me, it's a must-read because I live in an equitorial region and it's a way of fully appreciating the beauty and natural environment around you. Sakul Intakul was a pioneer really because it's only in recent years that this idea of using native flowers and humble materials to achieve a light, glass-clear look has really caught on with the more "modern" restuarants and hotels. He was one of the first to use tropical blooms in tandem with unusual materials such as chicken wire and humble materials like leaves, reeds, or airy forms crafted of strips of bamboo, in a contemporary way. The book is a feast of colour for the senses and a store of useful insights. For example, he compares the difference in tropical and temperate flowers to the nature of the people in the society, noting that tropical flowers are often very small, found in communal clusters and more neutral in colour, hence to work with them you have to understand that they always hold attention as individual blooms, rather you have to find ways to complement the flowers and create arrangements that will accomodate and showcase their delicate and subtle intricacy. The creative floral arrangements consistently achieve elements of surprise and visual appeal while only occasionally striking a jarring note. From highly dramatic, large-scale installations to meditative pairings, the book provides some great ideas that can be adapted for home use, so you should totally at least flip through them. Michelle works in fashion and I love the latest collections from Lanvin, so the colour theme was a forest purple, mossy green and blue. When it comes to dinner though, is it important how the table looks? Well, I'll be the first to admit, I'm a shallow, aesthetic person. To me, it's pretty dang important! Plus, hey, what's a party without a proper celebration? And of course, it just gives me an excuse to muck around with flowers, balloons and match tablecloths with napkin rings, crockery and cutlery. Along with blue mittens and kittens, some of my favourite things. I'm a big fan of nurseries and cold rooms. I'll do a later post on the different food and flower shopping destinations in Singapore and how to get the best deals but one thing to think about when you do get into flower arranging is you want to think about one, shapes and two, if you're going traditional or unusual. Shapes refer to whether you're making a full vase arrangement, as in this case, or making something angular and tall like topiaries (wow, how Martha Stewart is that word, eh! ), or triangular, or experimenting with unusual vase shapes and tropical flowers. With regard to the type of flowers, I tend to gravitate toward the peach and terracotta roses just because those are the most common and thus frequently on sale but the shameful reality is, I actually find roses, sunflowers, gerberas rather declasse. I much prefer unusual flowers, hydrageas, lotus pods, peonies, rununculus, even cabbage roses. You'd be surprised, not many people know how to use them and hence these are often passed over and sometimes heavily discounted if you keep your eyes peeled! I enlisted the help of Karen from Mad Baker for the party favours which were her absolutely gorgeous macarons and the birthday cake. Her macarons are hands-down the best I've tasted in Singapore, go order some from her today. And, she is an absolute sweetie and so easy to work with. I loved the order, loved her cheery and helpful attitude, loved her products, which entirely perked up the party. Now that the stock for pho was boiling, I'd decided the side dishes should be a Thai pomelo salad and Vietnamese Spring Rolls. First, the pomelo salad. Find yourself some Thai pomelos in the market, or Malaysian pomelos. I must admit, I got these in Phuket and carried them home in my duffel bag. The difference between Thai pomelos and regular Malaysian pomelos, is that the Thai ones have this jewelled peach colour and are much smaller, juicier and sweeter. The Malaysian ones tend to be a bit more astringent and sometimes have a disappointing dryness or bitterness. The bowl in front are the Thai pomelo and the bowl at the back are the duller Malaysian pomelo. The recipe for pomelo salad is slightly more complex and I must say, I didn't many take pictures of the interim steps. Basically you need to make a sauce. You take 2 generous tablespoons of tamarind paste (pictured below, yes, I know it looks like turd) and heat it with water and 2 heaped tablespoons of Thai palm sugar. Whisk it into a thickish sauce and then sift away the seeds and flesh of the tamarind, which should leave you with a much more fluid sauce. Note, there are three different kinds of palm sugar, one is the brown peaty gula melaka that is commonly used in South East Asia. The second is the Indian palm sugar and the third is the Thai palm sugar which is a thick, bright mustard yellow paste. Don't use the wrong one! This will be the sauce for the pomelo salad. Mix in some chilli- this is done by frying dried chilli, then crushing it in a motar and pestle to form fine chilli flakes. Don't put in too much chilli or no one will be able to eat your salad, those dried chillis are potent! Crumble up the pomelo and add fried shallots, dried coconut flakes, 2 Tbsp of fish sauce, finely sliced chives and cilantro and fresh red chilli (discard the seeds). You can make the shallots and coconut from scratch by slicing and deep frying shallots and dry-frying fresh coconut and pounding it into fine flakes. Saute a handful of fresh prawns and toss them in, then drizzle the sauce over and serve. For the Vietnamese spring rolls, mix l pound of ground pork with some cornflour, 2 Tbsp rice wine, oyster sauce and crack an egg into it. The recipe technically says 1 pound, I just go with 50g for each person eating, so this was about 800g worth of pork. I skip the traditional carrots because I'm really weird, I don't like to see orange inside my spring rolls and also, it has a longer cooking time then the other vegetables. I sometimes double the amount of beansprouts though, for a crunchier spring roll. Then you want to get 1 package or 4 ounces of vermicelli soaked in hot water for 15 minutes, then drained and chopped and add that to the mix. Add the pork mix to the vegetable mix and pack them all together. Yes, you can use your hands. Get frozen spring roll wrappers (the dry rice wraps are good too, just more difficult to work with) and lay the wrapper diagonally in a diamond shape. Spoon in your mixture. Basically, you notice that the concept of a spring roll is essentially vegetarian, the pork just holds the bits together. You imagine that spring roll wrapping is one of those things that gets passed down to all Chinese children but let me tell you it is not true! There is definitely some technique involved, firstly, in using the wrapper on a diagonal and secondly, tucking the ends back into the fold and sealing it with warm water. In fact, maybe we should all be buying Synear (SYNF.SP), China's leading frozen dumpling manufacturer, listed in Singapore because I'm convinced in a generation's time, China will all eating frozen dumplings because all the women are out working rather than rolling wrappers. This is what you should wind up with though. Then when your guests come, you want to fry these in oil. Deep fry yeah, so the oil must cover the spring rolls, not some sort of pan-fry toasty job. A tip, if you want crunchy, crisp spring rolls, you deep fry your dumplings twice. Once to brown the skin and cook the insides, then let it cool and fry them in the oil again so that the skin crisps through and hardens slightly. The Great Pho Making Exercise 2! The Great Pho Making Exercise!